I woke this morning to find a light dusting of snow outside covering the lawn and streets. The colder temperatures and rain are something I’ve grown accustomed to living in the Emerald Isle, but snow is something so foreign. While looking out the window I pondered what to do to keep warm. My first thought was to build a fire, but that was out of the question. The next thought, of course, is comfort food. 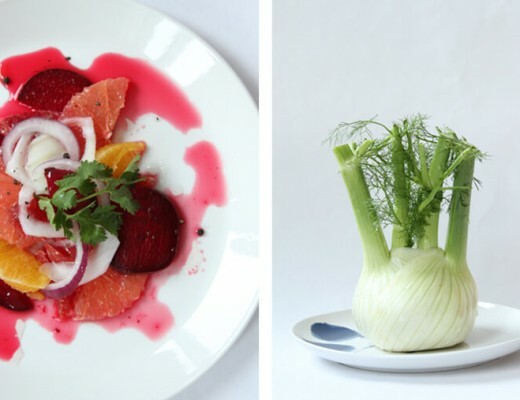 At this time of year it has to be something rich, nourishing and earthy. I know just the thing – bread. I’ve been looking forward to sharing this recipe very much, only because it is really good. This bread does not need much in terms of toppings. 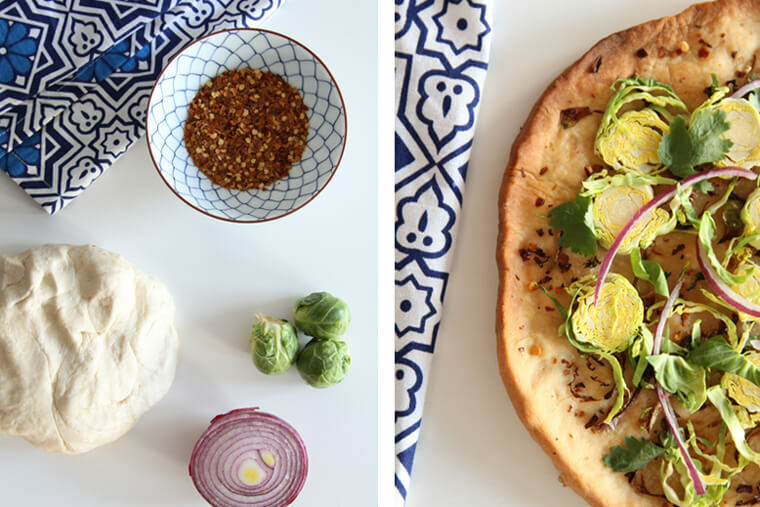 It can easily be enjoyed on its own or topped with something a little creative, like Brussels sprouts and red onion. Sift flour into a medium bowl. Dissolve yeast and salt in lukewarm water. While stirring with a wooden spoon, add to flour and stir in olive oil until well incorporated. Mix dough gently with your hands to bring it together and form into a rough ball. Transfer to a large bowl. Cover with a clean dish towel and let dough rise at room temperature until dough has doubled in size, about 1 – 2 hours. Transfer dough to a floured work surface. Divide into 4 equal portions. Working with 1 portion at a time, mold gently into a ball. Roll out portion of flatbread dough on a piece of parchment paper or a floured baking sheet. Repeat with remaining portions. Arrange dough disks on baking sheet and sprinkle with crushed red pepper flakes. Bake bread until it is crisp and browned – about 30 minutes. Top with desired toppings. Share and enjoy! what a simple and delicious meal! i love red onion and brussels sprouts together. perhaps i’ll make some socca and use those toppings! I adore the combination of brussels sprouts and red onion as well. I always think simpler is better :) You’ll have to let me know how it turns out for you! Do you have a socca recipe on your blog, Caitlin? I’d love to try it! Yes! I’ve been craving bread-y things so much lately with all of the cold. Flatbreads with delicious toppings is a great, winter cozying strategy. 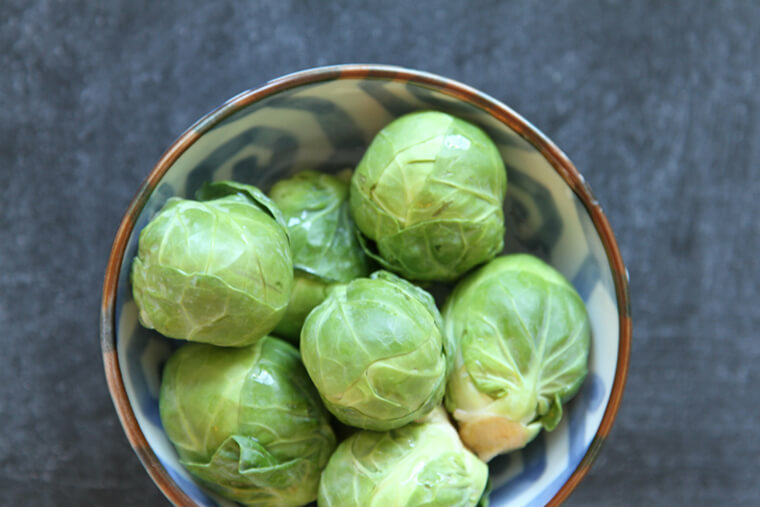 Those rounds of brussels sprouts are so beautiful too. 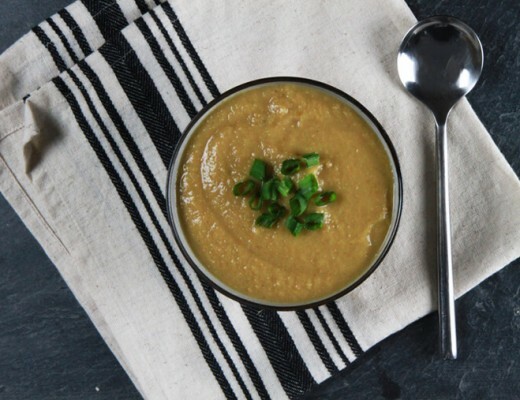 I’ve been eating a lot of soup this winter – and what goes perfectly with soup? Bread :) Truly satisfying and warming.